Bone Sialoprotein antibody LS-C312662 is an unconjugated rabbit polyclonal antibody to Bone Sialoprotein (IBSP) from human, mouse and rat. Validated for IHC and WB. A synthetic peptide corresponding to a sequence at the N-terminus of human Bone Sialoprotein(17-34aa FSMKNLHRRVKIEDSEEN), different from the related rat and mouse sequences by three amino acids. 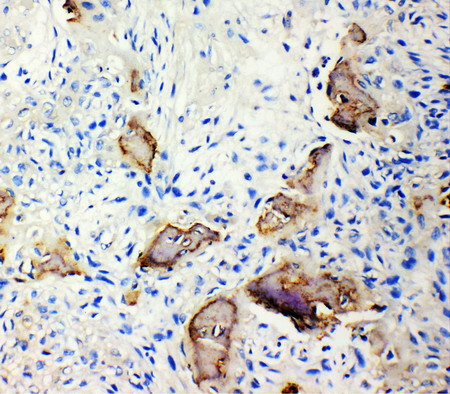 IBSP / Bone Sialoprotein antibody. IHC(P): Human Osteosarcoma Tissue.